TACLOBAN CITY – The National Maritime Polytechnic (NMP), a premier government-owned maritime training and research institution, moves into transition of leadership as Executive Director Joel B. Maglunsod takes the helm of the Agency’s directorship effective 01 February 2019 with the issuance of Certification of Assumption of Duty on the same date. The turn-over of NMP flag and the Symbolic Key took place in the morning of 04 February 2019, right after the flag raising ceremony inside the NMP Administration Building, Cabalawan, Tacloban City. The NMP flag symbolizes the assumption of leadership while the Symbolic Key stands for the authority and accountability that comes with the holding of office as Executive Director of the NMP. During the ceremony, Deputy Executive Director III, Mayla N. Macadawan who assumed the functions and responsibilities as the NMP Officer-In-Charge by virtue of DOLE Administrative Order No. 35, s. 2019 dated 04 February 2019, expressed her confidence that the new NMP ED would be able to steer the Agency in pursuit to the delivery of its mandate and functions. “During my very short stint as NMP Officer-In-Charge, I am very happy to help and assist NMP in the way that I can. Though I had very limited powers during those times but somehow we were able to surpass whatever challenges that we have encountered” said DED Macadawan. 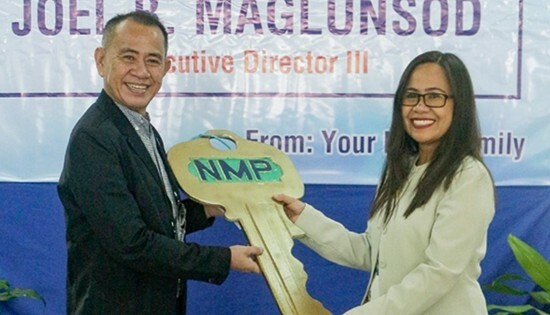 She also expressed her gratitude to former NMP ED, Dr. Romulo V. Bernardes, who resigned on 23 November 2018, for mentoring her and for all his contributions to the Agency. “I always say that family is not always about the bloodline, it is about someone who hold your hands in times of need. In NMP, we are always treating each other as a family. I am really lucky that I was able to work here in a short span of time as the NMP Officer-In-Charge” she added. “Taos-puso kong tinatanggap ang trabaho natin at magtatagumpay tayo sa collective efforts natin. Kailangan kung ano man ang mga nakikita nating problema ipaabot agad sa senior officials ninyo at kung hindi kayo inintindi ideretso sa DOLE Hotline 1349, pag hindi sinagot dun sa Hotline 8888,” ED Maglunsod disclosed. He also shared some issues and challenges confronting NMP as well as the maritime industry in general, including among others: Development and packaging of new courses (Training for Harbour Pilots and Crane / Winch Operators); Acquisition of training ship and towing tank; Attraction of massive trainees; and Maximizing the Use of NMP resources. ED Maglunsod also emphasized the need to sustain cooperation and collaboration between and among maritime stakeholders to be able to respond to the ever growing needs of the Filipino seafarers. Attended by the NMP employees, the activity was also graced by the members of the DOLE Regional Coordinating Council (RCC) RO-8 namely, Atty. Cecilio I. Baleña, OIC Assistant Regional Director of DOLE RO-8, Ms. Pamela Babalcon of National Conciliation and Mediation Board (NCMB), Ms. Mary Catherine O. Pastor of Overseas Workers Welfare Administration (OWWA), Ms. Meriam R. Balmocena of Philippine Overseas Employment Administration (POEA), Ms. Catherine O. Doblon of National Reintegration Center for OFWs (NRCO), Ms. Michelle C. Basal of Employees Compensation Commission (ECC), Engr. Ma. Elena Limen-Diez of Occupational Safety and Health Center (OSHC). Also present were former NMP ED, Dr. Romulo V. Bernardes and Ms. Arlene Maglunsod, wife of ED Maglunsod. Those interested in NMP research undertakings may visit the NMP website (www.nm.gov.ph) and access the e-Research Information System Portal which is designed to gather inputs for NMP’s research, dissemination of NMP completed researches and other articles pertaining to maritime research.